The H-D Muscat MY16 Open House was held on Saturday November 7th from 4:00 – 8:00 PM at the Harley Davidson Muscat showroom. The MY16 Open House event started off with a parade ride from Barka Grand Centre to the Harley-Davidson® Muscat dealership where a welcoming speech was given away. The unveiling of MY16 Motorcycles was the highlight of the day. 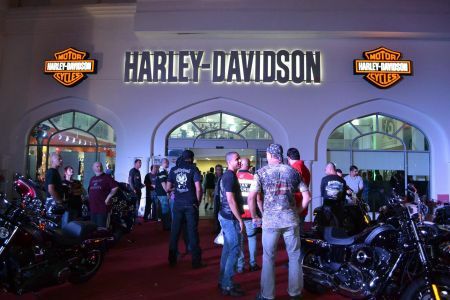 The live bands who played throughout the event fueled the excitement among Harley® enthusiasts. A open buffet during the afternoon was enjoyed. Harley-Davidson® Muscat supported the Oman Cancer Association with the event, funds gathered from the custom pins of the MY16 Muscat Open House event and was available to purchase throughout the day, all funds gathered was donated to the Oman Cancer Association. The new Iron 883 is intentionally raw and rough around the edges, with a modern design inspired by garage-built bobbers past and present. All-new front and adjustable rear suspension, lighter-weight mag wheels and improved seating increase comfort and control to smooth the road ahead. The new Forty-Eight achieves its menacing stance with a burly front tire, new mag wheels and a massive front end with new 49mm forks, and also benefits from improved adjustable rear suspension and seating. Retro styling cues and a perfect ratio of black, color and chrome give this bike a bold visual presence.